These words are written in the London Underground and announced on the loudspeaker to warn travelers of the gap between the tube (for you Americans that’s – subway) and the station platform. 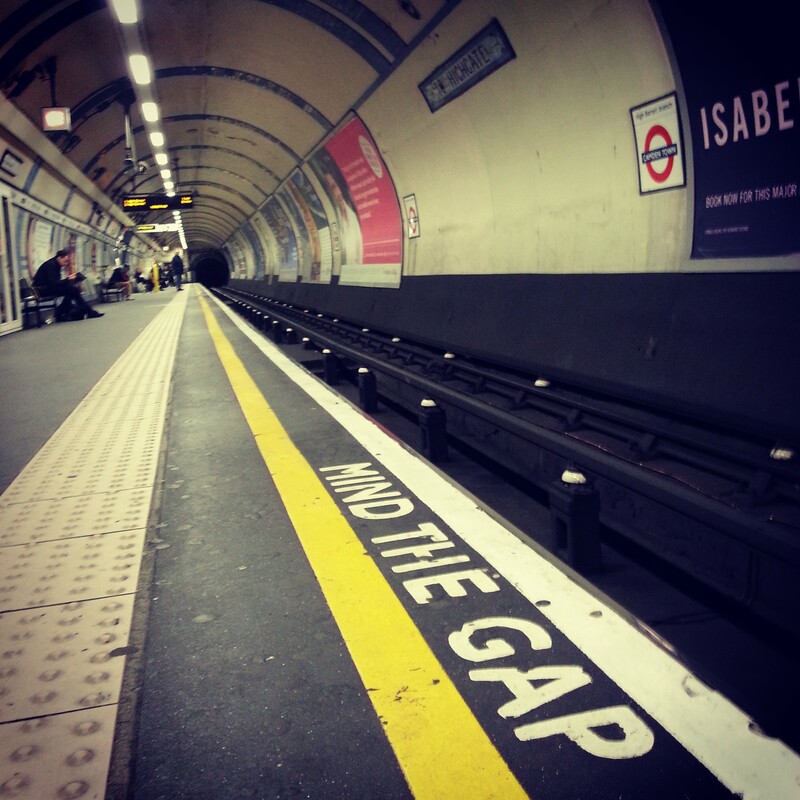 “Mind the Gap,” be careful, don’t trip. After ten days in beautiful London my thoughts are on a different gap. The culture gap. British order is impressive. Thousands of people travel back and forth, in the tube, walking the sidewalks, driving cars. There is no pushing, no honking and very little noise (the only people I heard shouting in ten days were other Israelis!). Massive streams of people were walking Oxford and Regent Street, doing sightseeing and Christmas shopping. Instead of a human mess, they simply, automatically arranged themselves in a stream per direction – people going one way walked on one side of the sidewalk while people going the other direction walked on the other side. That would never happen in Israel. If you bump in to someone in London they apologize to you. When store clerks say “it was a pleasure to serve you” you get the feeling like they actually mean it. Israelis jumble all up together. They have no sense of the meaning of a waiting in a line, being patient or being quiet. Israelis are noisy, nosey and messy. Israelis don’t automatically follow any rules or orders. First they ask “Why?” and then, if they agree, they comply. This is why we annoy many people from different cultures. This is also why we excel above and beyond many people. On the flight to England, there was a group of British women who had just completed an organized tour of Israel. They were mostly lovely, pleasant grannies – regular women. One of the women was walking up the aisle of the plane and Lenny (my boyfriend) noticed that she looked ill. Her eyes begin to roll up in to her head. Although she was right next to her friends, none of them saw that anything was wrong. Lenny quickly took the tray and the coffee pitcher from the hands of a stewardess close to the women, saying: “Give this to me and catch that woman, she’s about to fall!” Though startled, the stewardess immediately reacted, gave him everything she was holding, catching the elderly woman before she hit the floor. The El Al staff took the woman to the back of the plane and on the loudspeaker asked for assistance from any doctors who might be on the plane. A number of passengers were doctors. They immediately rushed to the back of the plane to assist the woman. Not a single member of the woman’s group turned around to look at their friend. No one made a move to help her. Not one. I don’t believe any of the people in that group was bad. They simply felt that “the authorities” were taking care of things so everything would be ok.
After some time, a few of the British women did go to check on their friend, hold her hand and keep her company. When the situation was critical none of them looked out for their friend, it was only after the fact that they stood by her. It was the Israeli alertness, quick reaction and assistance to strangers that kept this woman from being severely injured. She could have easily hit her head, broken a bone or worse. When there is a problem do you notice? If it is someone else’s problem, do you get involved? Do you wait for the “authorities” to fix it for you? This past weekend in Israel there was a snow storm. In a country unused to snow, a small storm can cause a huge amount of trouble. Municipalities don’t have the tools to keep the roads open. When trees fell, taking down power lines, the electric company found it impossible to reach many of the places cut off from power. As in other times of trouble the media created an open channel of communication, with constant updates on what was happening across the country and a telephone line for people to call and report any problems. They connected people and rescue workers, reported to the electric company, guiding to where help was needed. People who saw cars stuck on frozen roads went out to the trapped drivers bringing them food and drinks. When they saw that the roads wouldn’t open any time soon they invited the drivers to come stay in their warm homes. When the police announced that it might take days for the roads to open students began organizing places to stay for stranded people who couldn’t drive back to their home towns. The police did their job. The electric company worked (and still is working) hard to fix the problem. Rescue workers helped the injured. Average people did everything else. No one told them what to do. No authority solved the problem. It was just common sense. It was cold and there were stuck people who needed a warm and safe place to stay so the people who could, arranged it. Besides working to fix the storm damage throughout the country, the Israeli government also sent aid to the Palestinian territories and to people in refugee camps in Syria. In Israel the general attitude is, “I am my brother’s keeper.” And also that of others who are in need, even if they don’t like me very much. They may even want to kill me. They still need help. I liked your article very much! The cultural gap is so true and noticeable. I enjoyed reading your writing!!!! B”H! Forest Rain… this is one of the very best articles you have ever written!!!! AND…one of the best articles I have ever read that so thoroughly and cohesively describes Israel and her people… I love it!!! Sharing with many today!